What rule would you use when towing a trailer? What rule would you use when towing a trailer? Doubling the usual two-second rule is the best way to deal with the extra stopping distance that towing a trailer requires. If you can't fit a load in your car, the safest ways are either to have a roof rack with a custom mounted box, or to use a trailer. When not carrying a load on a roof rack, remove it so that your car is more aerodynamic. Your vehicle's manual will tell you how much you can safely carry on a roof rack. The roof rack manufacturer will specify the maximum load of the rack. You will also need to look for one that suits the shape and size of your vehicle. Not all vehicles can have roof racks fitted easily. If you are carrying loads on your roof rack your load must not extend more than 3 metres forward of the front edge of the front seat or four metres behind the rear axle. The maximum length of your car plus load must not exceed 12.6m. The load must not extend more than 1.25 metres either side from the centre line of the vehicle. If your load extends behind the back of your vehicle by more than 1m then you'll need to attach a white, or fluorescent orange, red or yellow flag of at least 40x30cm in size. Loads must be tied down and should not be able to bounce around. When carrying loads inside your vehicle, or a on the tray of a ute or trailer, spread the load evenly to keep the height as low as possible. Put larger, heavier items at the bottom, and arrange items so that they don't move about when you turn corners, brake or accelerate. Arrange loads so that they don't project outside of the body of the vehicle, if possible. Cover them if they will be affected by the wind (see the trailer section below). Heavy items such as gas cylinders and tool boxes should be restrained very well, preferably against a cage to stop them moving forward in the event of an accident. Small loads can be carried safely with the proper positioning and fastening. Any heavy items will affect the stability and handling of your motorbike, so it is best to keep these as low as possible especially on lighter bikes. Of course, your load should not drag on the ground because this can create a hazard for other road users if something breaks off, and it could catch in a groove in the tarmac and flip you off your motorbike. 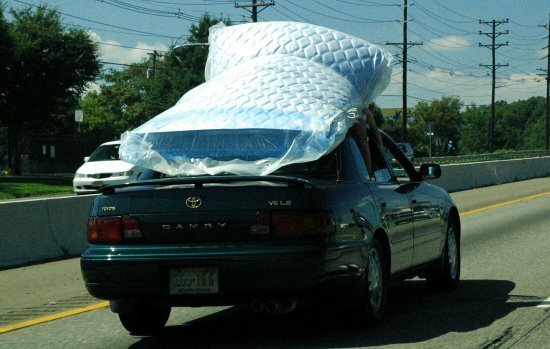 For lower loads, be careful that they won't touch the ground when you are leaning over for a corner. The load must also be secure. Riding with a load balanced on your handlebars is dangerous as it can move around, and you will have less control over the bike because you will need to manage the load. Secure them in saddlebags, tank bags or panniers, or under the seat if you have space there. If you have a small luggage rack on the back of the bike then fasten it with either a strop or elastic cords, but make sure the ends of these don't hang down and risk getting caught in your wheel or chain as this can lock the wheel causing you to skid. Keeping the load central helps with balance. Your load should not extend more than 50cm either side of the centre line of your motorbike. It also must not project more than one metre in front of the front wheel or more than one metre behind the rear wheel. Distributing the load evenly will help with your balance. Rather than putting the whole load in one saddlebag, divide it in two. If this isn't possible, you could add extra load to the opposite saddlebag. Carrying an uneven load can cause the bike to pull to one side, and makes it much more difficult to control on bumpy surfaces. Check the load whenever you stop to make sure it hasn't moved. If you trailer including its load is up to half the weight of your motorbike the maximum speed limit is 90kphg. If your trailer including its load is over half the weight of your motorbike the maximum speed is 40kph. Loads in a trailer must be secured and not able to bounce out of the trailer, or fall over the sides. It's preferable that they are in compartments that are rigidly attached to the trailer. If not, they should be in a cradle or frame designed for the load. If this isn't possible they should be held in by lashings (webbing, strops, ropes or chains) that are securely fixed to anchor points. The lashing capacity is half of its breaking strength, e.g. if the breaking strength is 200kg, the lashing capacity is 100kg. The lashing capacity must be at least twice the weight of the load, so you will need to use as many lashings as necessary to achieve this figure. If you are carrying a loose load, for example, gravel, then the load must remain 100mm below the edge of the trailer. If the load could be affected by airflow then you will need to cover it with netting or a tarpaulin. The types of loads that might need covering are garden waste, silt, sand, gravel, builders mix, wood chips and general rubbish. Goods or animals on your trailer must be placed where they won't injure anyone or distract you while you are driving. Position the load so that the heaviest items are as close to the axle as possible, and balanced. You don't want to have too much load up the front of the trailer as it puts too much stress on the towball. You also don't want all the load on the back of the trailer otherwise it tries to lift the towball and this will give you less grip in the rear of your car. You want some downward force on the towball to keep the connection. If you remove any of the load part way through the journey you might need to rearrange the goods to rebalance the load. You will need to anticipate whether you should take extra strops or ropes to account for this before you leave. This video shows an example of how a load, which is flat and resting on the deck of the trailer, can be lifted by the wind. Your vehicle will have a rated towing capacity for an unbraked trailer (usually 750kg) and a trailer with brakes (which could be anything up to 3500kg) depending on the weight of your vehicle, the chassis strength and the power of the brakes. For more information about carrying loads in a trailer read our guide to towing loads, or visit NZTA's guide to safe towing. Check out our main article about carrying loads in heavy vehicles as there are many more regulations.